Great bull, easy to work and will eat out of your hand . 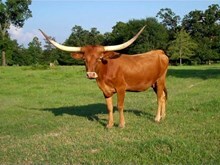 Most of his offspring have flat horns, even from the high horned cows. I keeping most of his heifers. 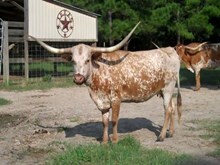 They have a good body size and early horn growth and great color. 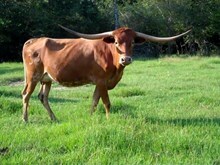 Put him to work in your pasture you will not be disappointed. Sales with bull calf by Powderhorn. Bull calf a side by Powderhorn. Heifer calf at side by Powderhorn. 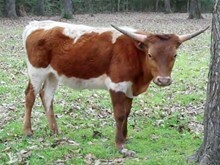 This young bull is looking for a good home, He has great color, Thick body and if you look at his Pedigree all you see are big horned cattle.